On Monday United Nations (UN) and African Union (AU) mediators tried to put a positive spin on the latest Darfur peace talks failure. Talks may resume in three weeks, leaving little time to broker some viable deal before a proposed 26,000 UN/AU peacekeeping force enters Darfur in early 2008. The Libyan-hosted gathering attracted few of the main rebel protagonists, instead featuring a gathering of relative unknowns and splinter movements. But not only have key rebels stayed away, the Khartoum government with whom they are supposed to negotiate has collapsed. Two of the main rebel factions – the Sudan Liberation Army (SLA) wing led by a Paris-based lawyer, Abdul Wahid al-Nur, and the Justice and Equality Movement (JEM), did not go to Libya. Wahid wants international peacekeepers on the ground first – he is widely popular among ethnic Fur in Darfur’s camps, but has relatively few fighters. For its part, the JEM does not take the UN or the AU as honest brokers, and linked with another SLA wing – ‘Unity’ – to form an effective military opposition to the government forces. Libyan leader Col. Muammar Gadafi’s hometown Sirte staged the talks. He stated that the Darfur conflict is a tribal ‘fight over a camel’ and that the world should cut Khartoum some slack on international peacekeepers. Such an assessment suits the President Oman al-Bashir’s National Congress Party (NCP), which has ran Sudan as a military dictatorship since taking power in a 1989 coup, as by extension, it means that the proposed hybrid UN/AU force has no place in Darfur. Sudan’s government, meanwhile, is in limbo. On October 11, the SPLM/A), abruptly left the Sudanese government, accusing Bashir’s party of backsliding on the landmark 2005 power-sharing agreement that ended the 22-year civil war between the mostly Muslim North and the predominantly Christian South Sudan. But that deal did nothing to address Darfur, and now, international attempts to solve Darfur’s problems are going ahead without recognising the links between Darfur and Sudan’s other wars. South Sudan will vote on secession in 2011, and the SPLA/M’s withdrawal from government makes such an outcome more likely. Before that happens, though, the North-South border needs marking, a delicate task given that much of Sudan’s oil sits right in the middle in a disputed area called Abyei. Bashir rejected the official Boundary Commission finding that could place much of Abyei’s oil in South Sudan. Abyei will itself vote on whether it wants to be part of the North or South in 2011, so if it goes South, and the South secedes, the oil goes too. 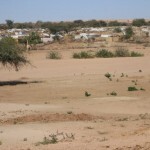 Complicating matters further, oil-rich areas along the proposed border stretch into Darfur. Yet oil is hardly the sole factor linking Darfur and the South. Pure politics are at play as well. As part of the 2005 North-South peace deal, Sudan is slated to hold national elections in 2009, 2 years before the South’s secession referendum. In a fair contest, Bashir and the NCP will surely lose power in Khartoum. Many northerners resent the South’s potential secession almost as much as the NCPs long monopoly of power and patronage. In elections, the SPLM will likely win big in the South, making secession more likely in turn. But elections will be difficult to run amid fighting in Darfur and along the North-South border, so the NCP is surely stalling peace now to forestall bigger losses later on. And an independent South Sudan would be more amenable to western petroleum investment than the NCP-dominated government in Khartoum, protected at the UN Security Council by China, which imports much of Sudan’s oil. Last Tuesday JEM kidnapped 2 foreign workers during an attack on a Chinese-run oil concession in Kordofan – which borders Darfur and Abyei –, seeking to take the fight outside Darfur and into a zone where the NCP-led Army repeatedly clashed with the SPLA/M before the 2005 deal. And it sent an ominous signal to Chinese, Indian and Malaysian oil companies working in Sudan. And while talks went nowhere in Sirte, JEM leaders met SPLM officials in South Sudan, issuing a joint statement supporting the SPLA/M withdrawal from government. In 2003, the original SLA rebel group in Darfur was aided by the SPLM at the outset of the Darfur rebellion, opening a western front against the NCP. This increased leverage in the run-up to the 2005 North-South peace deal encouraged the NCP to cede much – on paper – to the SPLM. Now it wants to avoid doing likewise in Darfur. But now a broader front looms. Muslim Darfurian rebels linking up with the largely Christian South Sudanese, against the Islamist Arab generals dominant in Khartoum since 1989.